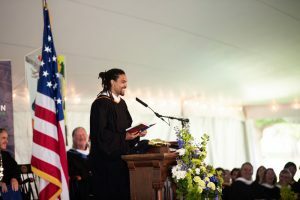 Editor’s note: Pierce Freelon ’02 delivered this speech during the 177th Commencement exercises on May 26, 2018. It is so nice to be back here at Williston. Just a little back story: I was really nervous about delivering this speech today. I’ve given a lot of speeches, but this is probably the most nervous I’ve been, being back here on this campus and I didn’t actually have anything prepared until yesterday. I wrote it in my journal, so we’re just going to read from my journal if that’s cool, alright?